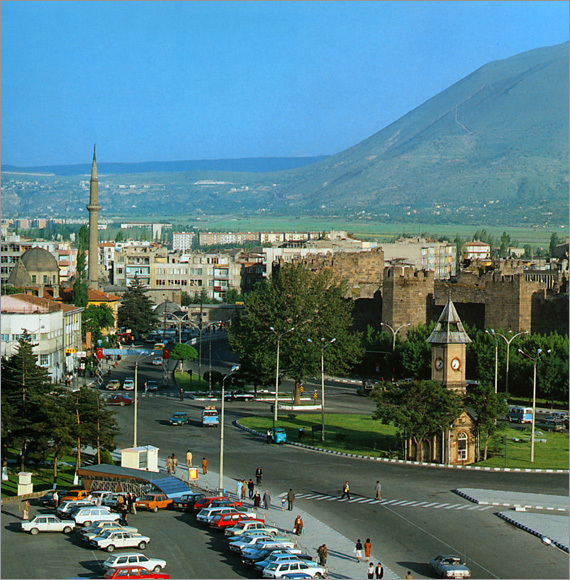 Kayseri, which has been one of the major commercial centers of Anatolia since the ancient times to the current era, is on the South of Kizilirmak River. Its ancient titles are Mazaka, Kaeseraea and Kayzer. The oldest settlement within the borders of Kayseri is Kultepe Tumulus, which is located at 20 km. northeast to the city. Vestiges of Old Bronze Age, Assyrian Trade Colonies (At the beginning of 2000’s B.C.) and Hittite era have been found in the center, which has been an important settlement since 3000 B.C. Kayseri, which experienced Phrygia, Cimmeria, Lydia, Med, Persia, Hellenistic, Kingdom of Cappadocia, Rome, Byzantine, Seljuk Empire, Ottoman Empire and Republic eras within the previous centuries and which became a province in 1924, has got a rich cultural heritage. Districts of Kayseri are: Akkisla, Bunyan, Develi, Felahiye, Hacilar, Incesu, Kocasinan, Melikgazi, Ozvatan, Pinarbasi, Sarioglan, Sariz, Talas, Tomarza, Yahyali and Yesilhisar. Grave gifts coming from Bestepeler and Garipler tumulus and works of Assyrian Trade colonies, Hittites, Phrygia, Hellenistic, Rome and Byzantine eras are exhibited in a chronological order in two halls and garden at the two storey museum. Selamlik part (the part of a Muslim house reserved for men and boys) of Gupgupoglu Mansion, which was constructed in 1419 – 1497 at Melikgazi district and for which various supplementary constructions were made until 18th century, has been arranged as the Ethnography Museum. Other parts of the mansion consists of haremlik part (the part of a Muslim house reserved for women and girls), harem room, hall, bride’s room, kitchen, vassals’ room, guest room, daily room and bride – bridegroom room. Golden, silver and bronze coins belonging to Turkish – Islamic eras are exhibited in Ethnography Museum, as well as tiles, weapons, woods, mines, manuscripts, carpets, rugs, dresses, jewelry and ornaments emphasizing regional characteristics of Kayseri. Ataturk stayed at the house, which was built at Cumhuriyet Quarter in 19th century, on December 19th, 1919. Documents and photos about Ataturk’s visit to Kayseri are exhibited at upper floor of the house, which is built as two storeys by using hewn stone. The double medresse, which is a work of Seljuk era and which is located within Mimar Sinan Park at the Cumhuriyet Square, is used as a History of Medicine Museum today. Structures constructed in 1205 consist of two buildings with adjacent open court yards. Among the structures connected to each other via a corridor, dimensions of Giyasiye Medicine Medresse on the east are 60 x 40 m., and dimensions of Gevher Nesibe Sifahane (Hospital) are 32 x 40 m. and it has a plan with four terraces. Today, equipments and materials used in medicine are exhibited in this building in which healthcare, education, and research activities used to be carried out together, and which has a great importance since it is the oldest hospital in Anatolia. Ground floor of the 6 storey structure is the City Museum and the first floor is Mimar Sinan Museum. There are management rooms, restaurants and cafes on upper floors. There is a Kayseri City Model and kiosks surrounding it, by which information about the city is reached, in the middle of the City Museum, in which issues about Kayseri are presented as videos. In Mimar Sinan Museum on the 1st floor, besides exhibiting models of Mimar Sinan’s major works, also all kind of information about this architect, who has a great importance for Ottoman architecture, is presented to the visitors as videos. Tumulus, height of which is 22 m and diameter of which is 500 m, consists of downtown around it, which is called as “karum”. In excavations realized at the tumulus, located at 20th kilometer of Kayseri – Sivas road, on 2 km. north of the road, traces of Assyrian, Hittite, Rome and Persia eras have been found. Most important ones of the findings present in the tumulus, in which there has been residence since the old chalcolithic era, are tablets with cuneiform script and cylindrical stamps belonging to the Assyrians. These works are the oldest written documents known in Anatolia. Materials coming from Assyria to Kultepe, a large trade center, were being sold to public against tin, cloth and wool, gold and silver. Architectural vestiges of large religious and official structures, houses, stores and workshops in Tumulus and Karum can be visited as open – air museum. The relief on the rocks which are located on the southeast of Develi, is an original example of the Hittite art pertaining to A.D. 14th century. On the left scene among the two, around the altar in the middle, two standing and cone-head figures in short skirts appear. It is noticed from the hieroglyphs in their hands that the one on the right hand is King Hattusili III and the one on the left hand side is the God of Storm. On the right of this scene, a goddess appears sitting on the facades of Kargamis Palaces along with the nuns covering themselves with a cloth. Sitting on the throne, Ishtar the goddess holds a goblet in her left hand. The woman on the right side, who is revealed by the hieroglyphs in her hand to be Queen Puda-Hepa, the wife of King Hattusili III, stands and serves libation. On the Hittite relief in Imam Kulu Village which is 40 km away from Develi, the God of Storm is seen over the bowed-heads of three mountain deities in a cart drawn by a bull. The demons with the body of a man and head of a bird hold the mountain deities with their arms. On the right of this scene, a winged demon on a stylized tree and on the left side a young deity holding a stick in his hand is seen. The spaces on the right and left sides of the scenes are decorated with several animal motifs. The building with pediment on Istasyon Street which dates back to 2nd or 3rd century and the round-arch rectangular tombs built with the large marble blocks which are located in Felahiye District Kebic Village remain from the Roman Era. Also, covered-stone Tomarza Sarcophaguses in the shape of walled tombs which are located on the west of Komur Village attracts many visitors. Located on 40 km southeast of Urgup in Yesilhisar District of Kayseri, Soganli valley, which has been one of the centers of Cappadocia and inhabited since Roman Era, has approximately 50 rock churches and caves. In the valley, which bears the characteristics of an open air museum, some rock formations similar to that of Peribacalari (Fairy Chimneys) in Goreme can also be seen. Early inhabitants of Soganli used to live in the houses and shelters carved into the rocks. St. Barbara (Tahtali) Chapel, Karabas, Grand Church, Saint Joan Church, Yilanli Church (St. Onuphrius), Kubbeli (Domed) Church, Saint George Church, Gok Church and Tokali Church are the prominent structures in the valley. The Kubbeli (Domed) Church whose dome is made of Peribacalari (Rock chimneys) is located on the northern hillsides of the valley. With its vaults and apses, Kubbeli (Domed) Church has typical church characteristics. Dating back to the early 10th century, the church has a basilica plan with three naves and three apses. The frescoes in the church depict religious delineations similar to that of the other churches in the region. On the west side of the valley, stands St. Barbara Chapel with a single nave, single apse and a cradle vault. The manifestation of Christ, deesis, gospel, visit, and evidence of virginity, journey to Bethlehem, birth, Christ's going down to hell, seven sleepers, and many saints are represented on the walls of the church. The frescoes in the Karabas Church, which is located on the right side of the valley, have been painted in different times and techniques. Dating back to 11th century the church has a single nave, single apse and a cradle vault. Also, catacombs and the rooms of priests are located around the church. There are monasteries, churches and rock formations on the Erdemli Valley, 69 km to Kayseri. Rock churches, monasteries and small towns can be found in the Derevenk Valley in Talas District. Germir Village, 6 km to the city, houses made of hewn stone along with three churches are the centers of attention. Prokopis (1857) located in Melik Ghazi’s Agirnas town, Agil Anargi Church which is partly covered subterranean and the house where Mimar Sinan was born, the fountains he built and an underground city attracts the attention of the visitors. Yanartas Church (1837) in Kayabag, the historical vestiges, caves, and the old abodes made of rock are well-worth to see in the place. Sultan Mosque [Ulu (Grand) Mosque], which is located next to the covered bazaar in Camii Kebir District, was built between the years 1134 and 1143. Reconstructed in 1205, the mosque has a fairly high cylindrical brick minaret ascending towards the octagonal pedestal. Modified due to the reconstructions, the mosque has a lengthwise construction, quadrangular columns, a mihrab (niche) vault, and an illuminated small dome in the middle. Koluk Mosque, built in 1210 in respect of its epigraph, has a mosaic porcelain mihrab reflecting the Seljukian cini (ceramic tiling) art. Niche vault, light dome with pendant and a cupola on squinches covers can be seen in this mosque, too. 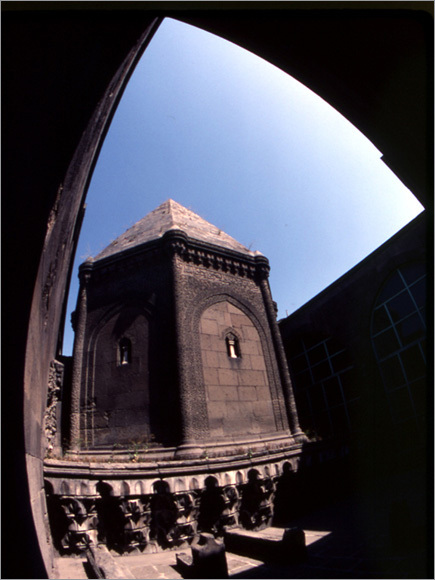 The portal of the mosque is significant as it conveys the classical characteristics of the early Seljukian portals. The Ayet el Kursi (Al Kursi) verse written on the Seljukian wooden minbar (pulpit) is an original one which is placed in the 13th century Seljukian Construction Lale Mosque. Square planned and vaulted, the mosque has a cupola which covers its central part. Adjacent to the East of the mosque, a polygonal turbe (mausoleum) furnished with a spire is situated and on the North a hamam (Turkish Bath) is found. 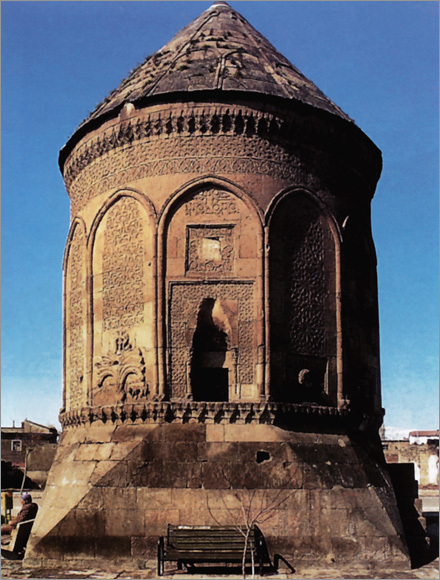 Hunat Hatun Complex whose construction finished in 1238 consists of a mosque, a madrasah, a hamam and a cupola. Out of the buildings made of hewn stone, the mosque structure consists of; a mihrab vault, a mihrab section expanded toward the central axis and sides which is accentuated with an iwan and a square yard and an original wooden minbar. With its corners and the towers alongside, the mosque resembles a castle with a double entrance. The entrance to the mosque, which has seven naves directed towards the qibla, is from the eastern gate. The larger and monumental western portal is geometrically decorated and has a marble epigraph. An octagonal planned turbe (mausoleum) which includes three tombs has been built in the Northern corner of the mosque. 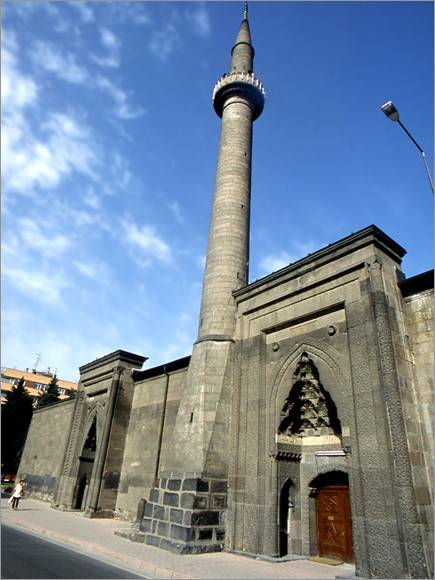 Constructed in 1249, Haci Kilic Mosque and Madrasah is located on the Istasyon District. From the adjacent two buildings sharing the arcade, the left one is mosque and the right one is madrasah and they have separate entrances. The accentuation on the mihrab niche cupola and the central nave is fairly impressing. 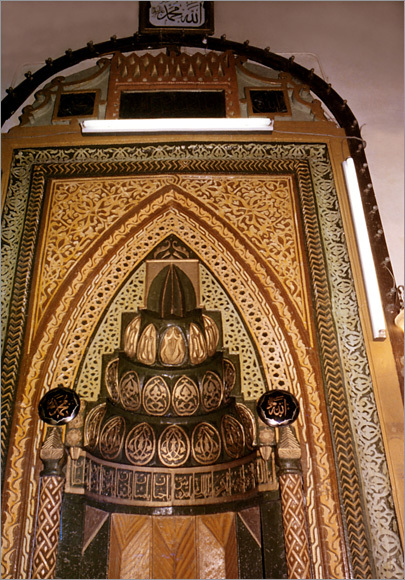 The stone mihrab of the mosque is original. The mosque and the madrasah have monumental and projecting portals on the eastern fronts. Constructed in 1267, Bunyan Ulu (Grand) Mosque has a thick wall made of hewn stone, three naves directed towards the qibla, and it is furnished with flat wooden ceiling over four-columned arches. Geometrical decorations resembling Kufic script and herbs, stylized lion and gryphon figures in curling leaves which were decorated on the mosque’s portal are also worth to see. Ulu (Grand) Mosque in Develi is one of the Seljukian mosques dating back to 1281. In the mosque with five naves directed towards the qibla, the lantern, mihrab cupola and central axis were accentuated. The geometrical and herbal decorations and the embossed fringes enrich the mihrab niche with a splendid nature. Other prominent mosques in Kayseri are Kursunlu Mosque built by Mimar Sinan in 1585 which features marble workmanship, original minbar, mihrab and rostrum, Fatih Mosque, which is located in the Castle, Yesilhisar Ulu (Grand) Mosque, which was built in 13th century, Han Mosque, which was made of smooth ashlars in Talas in the 14th century as a two-storey building, Melik Arslan Mosque in Yesilyurt Village, Karamustafa Pasha Mosque, which was built in 1670 in Incesu, and the other mosques dating from the 18th century built in Gurpinar and Molu villages. Built in 1238, Hunad Hatun Turbe was later constructed in the complex on the corner of the mosque adjacent to the madrasah. Tapered roof, six-sided cupola which ascends on a stalactite work marble pedestal was constructed with cut-stones. The decorated columns ascending towards the stem on the corners are outstanding. Doner Kumbet, whose epigraph reveals that it was built Sah Cihan Hatun, dates back to 1276. Ascending towards a square pedestal, the cupola is definiteley a splendid Seljukian work that each front of the polygonal stem’s pointed arch separated by fascias was embossed with a variety of geometrical motifs and mythological beings. The dodecagonal cupola, which was made of complete hewn stone, is covered externally with a tapered spire over a stalactite cornice, and internally with a dome. Kutlug Hatun Turbe (1349) has a grandiose and ornamented portal. Square- planned and stemmed turbe which was composed of smooth hewn stones, is covered with a pyramidal spire over octagonal tambour. Cylindrical Sircali Kumbet, which is one of the 14th century structures, was constructed with smooth cut-stones as a master crafting. It has a round sarcophagus chamber based on the plinth of the square plan. Built in 1247, one of the Cifte (Double) Kumbet is completely ruined which was located 1 km away from Kayseri. The other one is a less decorated structure with a pyramidal spire and a octagonal stem whose cubical sides ascends over moulding pendant. A wide geometrical star joint fringe surrounds the niche of the portal with stalactite work. Melikgazi Turbe, located in Melikgazi village of Pinarbasi District, dates back to 12th century. Based on square plan, the two storey structure contains seven sarcophaguses and mummies. Hunat Hatun Madrasah next to Hunat Hatun Mosque predates the mosque which was built in 1238. The madrasah which is adjacent to the northwestern corner of the mosque of the same name, porticos surround the three fronts of the quadrangle. It has a large iwan, muderris (teacher in a madrasah) chambers, and cells around the quadrangle to the eastern direction. The decorations of the portal in the western direction are fairly various and glorious. Friezes with joint geometrical and herbal motifs encircling the portal are striking. Built in 1238, Seraceddin Madrasah resembles Hunat Hatun Madrasah. The madrasah is a simple and small structure with three adjoining iwans and an entrance iwan. Sahibiye Madrasah is another Seljukian work in the Centrum. Dating back to 1267, the madrasah resembles a caravanserai facade. Cornices and joint corner belts encircle towers and facade walls. Round half columns appear on the portal and corners. The decorations of Joint geometrics, herbal motifs and the inscription belts all reflect typical Seljukian stone working. built in 1275, adjoins mosque and has a projecting portal in the eastern front. There are porticos around the courtyard and chambers behind in the madrasah. Located on a small hill called as Kosk Mountian, Kosk Madrasah was built in 1339. On the border of the hall leading to the entrance door of the square-planned madrasah, coved chambers in the form of iwans line up. Initially designed as a dervish lodge, the structure converted into a madrasah later. Built in 1432, Hatuniye Madrasah is located in the southern front of the Ulu (Grand) Mosque and pertains to the Dulkadir Dynasty period. The dilapidated madrasah was reconstructed. It has a typical madrasah plan with iwans and where the chambers line up on the edges. Located at the Centrum Kayseri Castle was built in the Roman Era (3rd century), then narrowed and restored in the Byzantine period (6th century). Taking its current form in Seljukian Era, the castle has two sections namely the exterior castle consisting of exterior ramparts and bastions; and the interior castle. However most of the exterior castle disappeared. There used to be moats and watch towers in the surrounding wall with five gates. The inner section of the interior, which strikes as an independent structure fortified with high and wide walls, involves Kale (Castle) Mosque which was built during Fatih the Conqueror’s reign and the sites where the jewelry stores are located today. Located 3 km away from Develi District, on a steep rock, Develi Fort is assumed to have been constructed in the Byzantine period due to its architectural style. Located 14 km away from Develi District, on a steep rock Oksut Fort dates from the Hittite Era. There are reliefs resembling a dragon holding a spear on the rocks. Built in Byzantine period in Pazaroren of Pinarbasi District, Zamanti Fort was restored and used in Seljukian and Ottoman periods. In the (Kululu) Fort located in Akkisla District, stone statues and hieroglyphic tablets pertaining to the Late Hittite period, as well as the architectural vestiges, were found. Other castles in Kayseri are Zengibar Fort, Akkisla Fort, Viransehir Fort, Hisarcik Fort and Zirha Fort. Located 30 km away from Kayseri, Tekgoz Bridge over Kizilirmak was constructed in 1212. Cokgoz Bridge is still intact with its 15 trusses. Kurukopru Bridge in Talas dates from Roman Era as an aqueduct. It is built over a river and has one pointed out of 13 round arches. Its bays were filled during the Seljukian period. Divided into two, the bridge was made of hewn stone, and its interiors were filled with rubble. Some parts of the bridge are ruined. 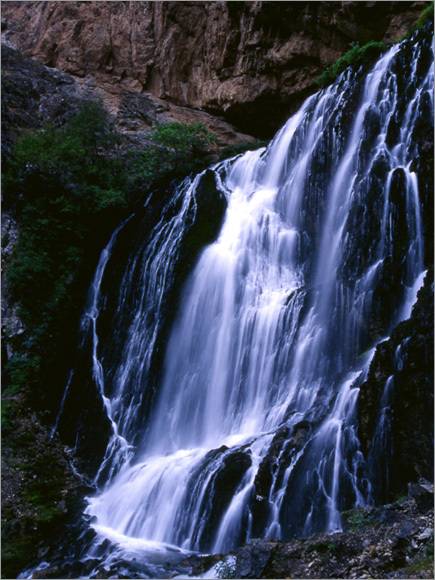 Bayramhaci Thermal Spring is located 65 km west of Kayseri and 1,5 km of Bayramhaci Village. The water is between 38ºC and 40ºC and the facility has 55 rooms and 140 beds and totally four pools, two for men, and two for women. Tekgoz Thermal Springs, in the Yemliha district 33 km from Kayseri have two pools; one for men and one for women. These thermal springs are at a temperature of 43ºC and the waters here are said to treat rheumatism, skin, respiratory system, kidney and urethras, and gynecological diseases. Yesilhisar Icme (Mineral spring) lies 70km southeastern of Kayseri and has natural hot water. The mineral spring in Zile which is located in Develi region and Haci Veli Thermal Spring located 16 km away from Kayseri-Adana highway, are effective for various ailments with their rich mineral water. 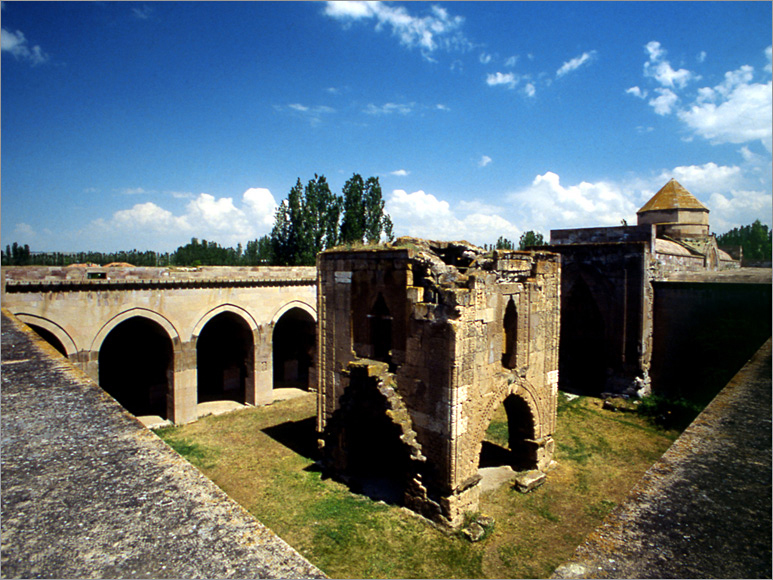 Sultan Han Caravanserai, located 50 km from Kayseri-Sivas highway, was built between 1232 and1236. With its colossal walls, additional towers and 3900 square meter building area, Sultan Han Caravanserai resembles a fortress. It is composed of indoor and outdoor places. Its geometrically decorated portal into the courtyard projects beyond and above the wall. The Kosk masjid, the small mosque, situated in the centre of the courtyard, is a beautiful example of stone work and has remained intact until current time. In the winter quarter, rear of the outdoor courtyard, there is a light dome. In the northwestern corner of the courtyard there is a Hamam with its domes. Karatay Han Caravanserai on the Kayseri-highwayroad was constructed in 1240-1241. Built in Seljukian style, the caravanserai resembles a fortress with its chamfered and trussed towers. The frontal facade of the caravanserai, richly ornamented almost like Sultans’ caravanserais, has been ascended on the corners and next to the 2.5m portal with chamfered and trussed columns. The decorations including winged lion carrying a snake in his mouth, various animal figures, also among rumi figures the ox head, human figures with round heads, floriated and geometric motifs are distinguishable. There is a domed masjid (small mosque) on the right side and a turbe coved with cross ribbed vault on the left side of the grand portal opening to the courtyard. Kara Mustafa Pasha Caravanserai, located in Incesu, is a complex with its mosque, minaret and 30 shops and was built in 1660. Kapali Carsi (The Covered Bazaar), is distinct as a significant bazaar as remaining sound until current time secondary to the other significant examples in Istanbul and Bursa. Built in 1859, the bazaar has four entrances and constructed on a 100 thousand square meters area. On the western side of the bazaar, there is the two storey Pamuk Inn where cotton shops placed. Vezir (Vizier) Han Caravanserai is a two storey structure next to the Covered Bazaar. Though having been built as an accommodation place for travelers, the building is now used for business purposes. With the fountain in its centre and with its distinctive architecture, Vizier Han caravanserai is a well-worth to see place. Bedesten (Covered Bazaar) built in 1497 and located inside the Covered Bazaar, is topped with three domes and other small vaults. Bedesten is used as carpet and rug bazaar and also it has three doors in the east, north and west sides. Located in Cumhuriyet Square, The Clock Tower is made of hewn stone in a square plan style in 1919. There is a clock on each of the four facades of the structure. Adjacent to the tower, there is muvakkithane, a small room with triangular pediment towards four. Bird Houses are seen around Gesi, especially on the hillsides on Kayabag route. These tiny structures, sized 2 to 3 meter and 8 to 10 meter height were built in stone cylinder forms. Kayseri entertains its visitors not only with its historical and cultural values but also with its nature. 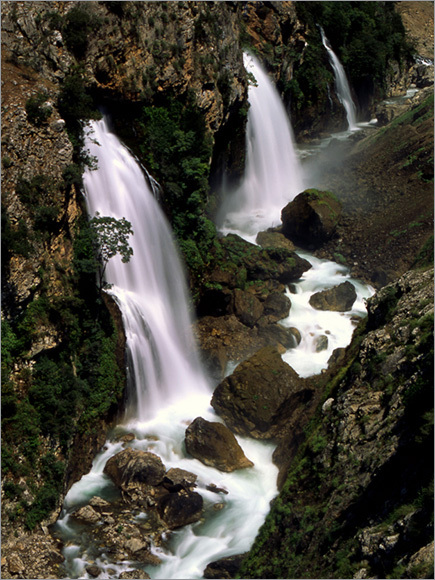 Yahyali Waterfalls, 76 km away from Yahyali region, have seven different levels whose heights vary between 30 - 50 m, and fall into the Zamanti River and eventually to Seyhan. This series of waterfalls, one of the most important in the world regarding flow rates and heights, is fascinating. The place called Yedigoller (Seven Lakes) and the Hacer Forests spreading over 18 thousand hectare field, in the vicinity of Seven area Lakes, are both alluring with their beauty. Sultan Sazligi (Sultan Reeds), lies 15 km of Yesilhisar district, is an internationally significant watery area with its 301 different species of birds. Inside the water, the plants like water lilies, lake ivy, moss and the animal species like water turtle and fresh water fish live as well. The prominent plateaus of Kayseri are Pınarbasi Plateau, Uzun Plateau, Erciyes Plateau, Tekir Plateau, Sezcer Plateau, Beyyurdu Plateau and Burhaniye Plateau. In Aladaglar National Park, camping sites, daily facilities, stopover sites, trekking sites and climbing routes are available as well as the angling facilities in the river. Inside the Aladaglar National Park rafting on Zamanti and Kizilirmak Rivers is another option. The Erciyes ski center on Mount Erciyes, 25km away from Kayseri, has two chair lift facilities 1450 m and 2575 m length. The ski areas are between 1800 - 3000 meters altitude. 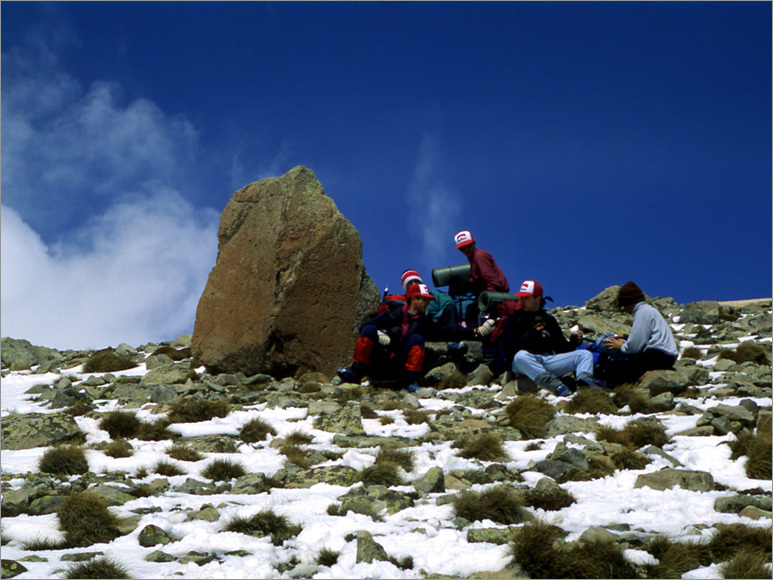 Mount Erciyes, Aladaglar Mountain, Hacer Ford and the Seven Lakes area are ideal places for trekking and nature trips. In addition to these, Gesi Valley which is famous for its historical houses and streets, Ozluce, Turan, Agirnas, Germir, Aydinlar, Derevenk Valleys are good for nature trips as well. Also, Zamanti River, Sultan Reeds, Kizilirmak River and Sarimsakli Dam offer places for sportive angling whereas Erciyes and Aladaglar Mountains have suitable places for parasailing. 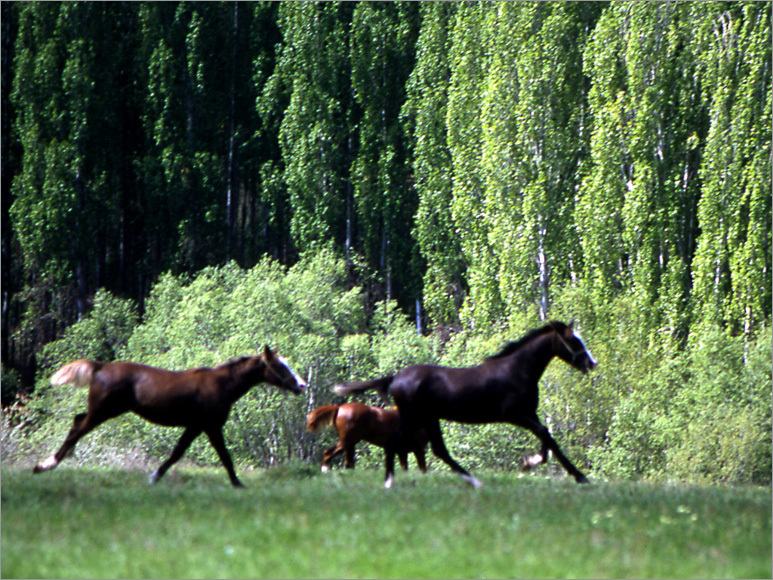 Furthermore, there are many available sites for horseback riding and camping. The most well known culinary in Kayseri are pastirma (pastrami), sucuk (garlic flavored sausage), and manti (a ravio like dish served with yoghurt). Kayseri cuisine is composed mainly of floury food; among the most famous meals are tandir boregi(pastry cooked in an oven under earth), arapasi (spicy chicken soup), kapama (Lamb first simmered , then cooked in a pen with lettuce), pilaf, gerdan (chuck meat cooked with raisins). Several samples from deserts are; telteli, gullu (fried rose shaped pastry in a thick syrup), kamis baklava, aside (made with flour,oil and syrup), pekmez helvasi(molasses halva) and nevzine (baked pudding with molasses). In Kayseri where coppersmith-working and leatherworking are still carried out though not much common, Bunyan and Yahyali woven carpets may be bought. Soganli, located in Cappadocia is famous for its cloth dolls. The famed pastrami should definitely be tasted.